When Bill Clinton received an actual “Father of the Year” statuette last year, we were curious about what separated him from all the dads who received their award in mug format. Apparently it has something to do with the number of times you mention your kids in political speeches, because Chris Christie has been named a 2014 “Father of the Year” honoree by the National Father’s Day Council. (He probably received bonus points for that time he took a State Police helicopter to see his son’s high school baseball game.) The father of four showed off his skills by instantly weaving the award into another anecdote about his kids. 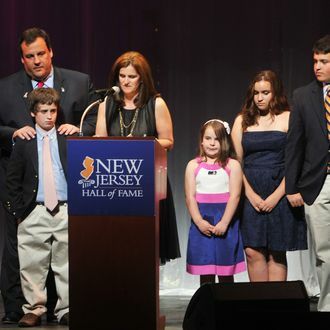 “I came home and told my children about it,” Christie said during his radio show Monday night. “They had a good laugh. Most kids, if you’re doing it right, love their parents, but I don’t think they’re the father or mother of the year. But it’s a really nice honor. (Being a parent) is the thing I care about most in my life.” Someone really doesn’t want another stupid tie.